The USS Lexington wants you! Corpus Christi’s beloved Museum on the Bay has volunteer opportunities with which everyone can get on board. Museum operation along with ship maintenance take a huge human effort, driving a continual need for volunteers in all capacities. Volunteers are asked to donate at least 10 hours a month, but Cooper said some people volunteer annually, working one of the many events hosted on board the ship during the year. About 30 Winter Texans volunteer seasonally as well. Currently, about 150 volunteers work on the “Blue Ghost,” a nickname the Japanese bestowed on the aircraft carrier during World War II for its ghostly ability to unexpectedly turn up near their ships. Today, the Navy's most storied carrier glows blue at night in honor of its wartime exploits. Volunteers from teenagers and older are welcome. The eldest volunteer just turned 93, Cooper said. People with physical limitations are also welcome. A military background is not necessary, she emphasized. 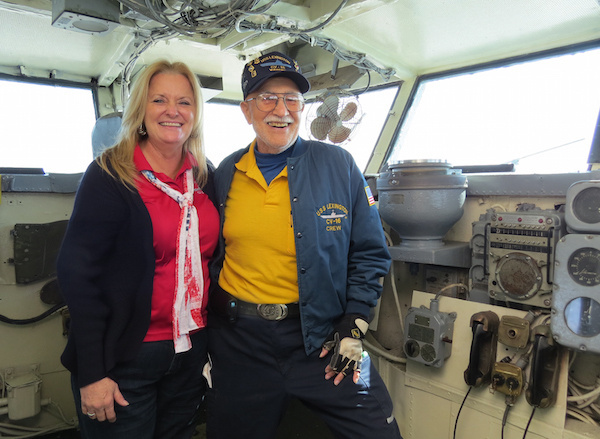 The best part of being a volunteer on the ship is getting to work with the other volunteers, longtime volunteer Bob Perry said. For more information on how you can volunteer, either email Cooper at debbievol@usslexington.com or call her at 361-888-4873 ext 302. The museum is located at 2914 N. Shoreline Blvd. Volunteers receive training and are provided with a nifty USS Lexington ball cap and shirt. After a certain number of hours are accrued, volunteers receive passes to bring guests on board as well as discounts at the ship store and mess deck. Volunteers are also feted at appreciation events and awards ceremonies. To become a volunteer, call, email or stop by the ship at 2914 N. Shoreline Blvd. and ask for volunteer coordinator Debbie Cooper. She will provide an application, which requires three references. Once the application has been accepted, volunteers go through a brief orientation. The level of training depends on which position the volunteer chooses. Anyone working in any of the youth programs also will take Safe Camp youth protection class. For more information, email debbievol@usslexington.com or call 361-888-4873 ext 302.